Ok, I have to admit that this series has been a lot of fun (well for me anyway ~ I have had a blast) – but this part is perhaps by far and away the most fun that I have personally had – as it means that I have needed to develop some sample Powershell scripts for monitoring Exchange 2010 using Powershell with Nagios! 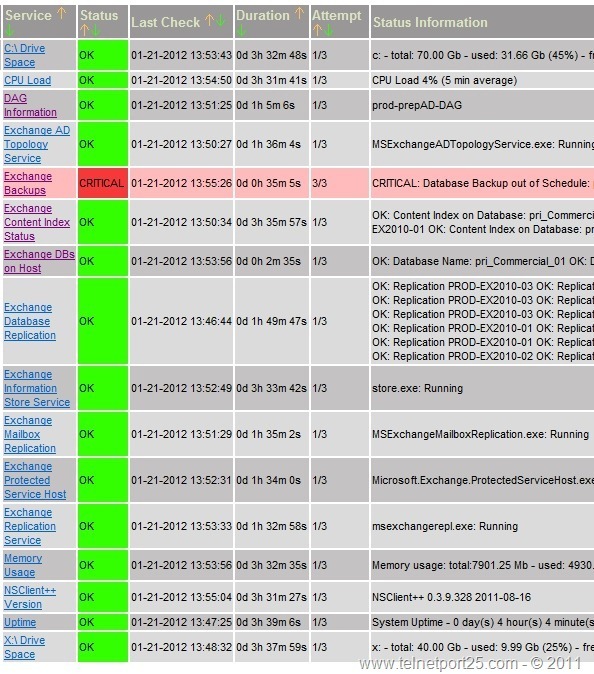 This is one of the real boons for Nagios – as by developing your own Powershell monitoring scripts which return values to the Nagios Core interface means that you are in essence using Nagios as a monitoring “wrapper” providing your with the flexibility to pretty much monitor any facet of your Exchange Systems. 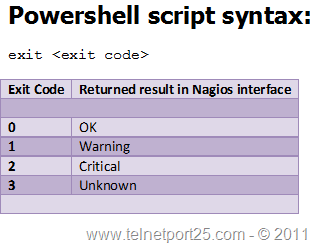 As mentioned above – it is important that any Powershell that your write for use with Nagios returns and exit code. Powershell has the ability to terminate execution with an exit code – this is demonstrated here – you can within your own scripts return any numeric decimal code that you want by using the “exit” statement. Ok so what is the Powershell script behind the Backup Monitoring? The script itself is pretty straight forward, and currently only checks for the lastFullBackup value on the Databases are resident on the Monitored Exchange Server. Within the script there is a variable called $ThreshHold which reflects the number of days that can lapse without a full backup before the script will return an error to the Nagios Interface. $Output = "OK: No Databases are active on this host"
$Output += $Res + " "
$Output += "OK: Database: " + $itm.identity + " has a recent backup" + " "
On your Exchange Server where you have installed the NSClient++, Copy (or save) the scripts into the NSClient “Scripts” folder (this should be in “C:\Program Files\NSClient++\Scripts”). For this example we will be using the “Exchange2010BackupMonitoring.ps1” script. Save the file, and then upload it back to your Nagios Server. Before you use them, you will need to ensure that you have created the relevant service and command definitions (described above). The following is a sample output from the above monitoring scripts within my environment, naturally the ideal situation is to have all your statuses reporting “OK” as you can see I have a problem with Backups! Hi Andy, thanks for these awesome how-to’s. I have been doing them like this and they work perfectly. I just have one question and i hope i am not being to forward. Will you be doing a how-to to show graphs, maybe like MRTG? Hiya Brad. Glad that you like the series. Yes I do intend to do a part on extended monitoring – probably in part 6. I have part 5 to do next plus a bonus spin off two parter. Thank you so much for all your work in this. I was trying to set up Nagios on Ubuntu 11.10 and found your blog, and it’s been VERY helpful. I’m using Nagios to monitor our Exchange environment too, so your posts have been amazing. I do have one question, as I’m newer to scripting and can’t figure it out. Your Exchange Database Repl script returns several “OK”s for the same servers, and I see in your screen shot it does the same in your environment. Why is that? Thanks again for all your hard work! I’ve been following along step by step, and you’ve been such a big help.